I look forward to trying this out – I tried to make socca once without success – I’ve just come across chickpea crispbread which was delicious – any ideas? I tried to make socca once with less than success! (Far less). I shall persevere, armed with your instructions! Wish me luck! I have been gluten-free for over 15 years (and had a g-f baking business for awhile….) I’m always looking for new ideas and this one sounds delicious and easy, except for perhaps getting the flipping part practiced. I’ll try it! Go for it–the fact that it’s only a serving spoon’s worth of batter keeps them to a flippable size! Interesting! My mom-in-law makes her matzoh meal pancakes using sparkling water too! Yum! Thanks Robin. I have been eating 98% wheat free for about two years, and this looks like a great food to try. One question: do they keep, or if I make more than enough for a single meal, will they fall apart in the fridge since it’s only batter and oil holding it together? Thanks! Hi Steven–I haven’t tried keeping the made pancakes–we finish then off! But the batter keeps in the fridge. I made another batch a couple of days later with the saved batter. Let me know if you save the made pancakes. Just the thing for tomorrow. The chickpea bread went down very well here. Pancakes being so versatile, I can pair them with aubergine and tomatoes that are waiting. Thank you for the concise but user-friendly instructions. It is called Gram four in Sainsbury’s. It has taken me months to track down! Waitrose used to have it but not anymore. I shall make these little pancakes today. Thank you. I discovered these wonderful socca pancakes on your blog early this year, and they have become a real favourite – delicious, thank you very much!! I usually make mine with lots of fresh chopped coriander, added just before cooking – really tasty. 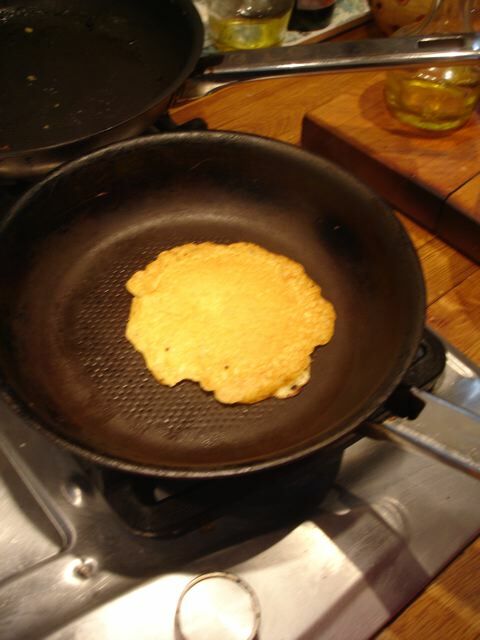 I now also tend to make just one big one in a large frying pan (2 – 2.5 heaped dessert spoons of gram flour is about right, the rest I do by guesswork). It does take quite a lot longer to cook though – and I seem to do OK turning the pancake over with a large spatula/fish slice. The only problems I’ve had have been occasional sticking to the pan when I’ve tried to use hardly any oil…! (A new frying pan has helped too.) 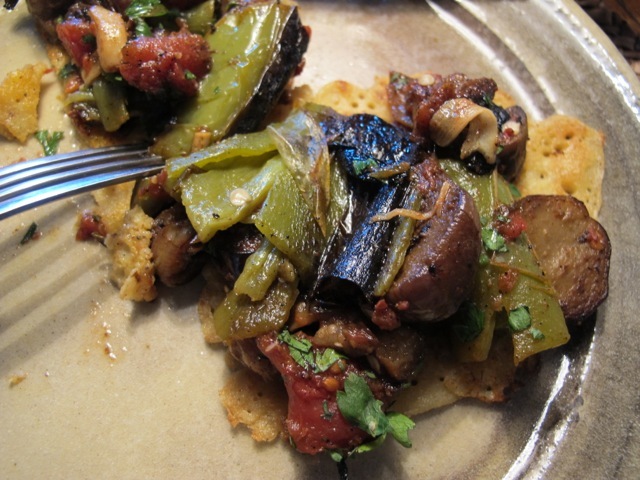 Also, once when I added chopped red onion and red pepper it burnt a bit – but I think you also did a socca ‘bread’ rather than pancake recipe, where such additions worked out fine? Great, as you say, with ratatouille. Bon appétit! Hi Wendy. Easing the spatula under the batter little by little helps I find.